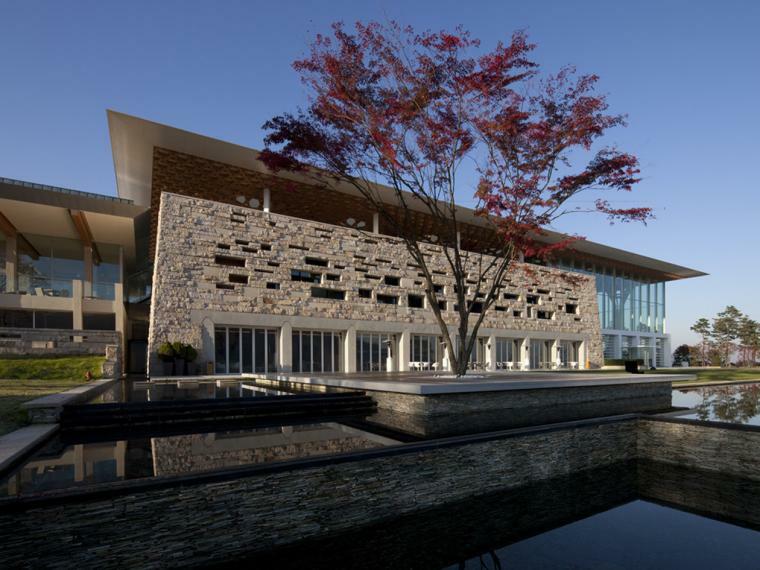 This is a new clubhouse for a premier golf course located two hours from Seoul by car. It is composed as three buildings: the main clubhouse for regular members, a VIP members area, and accommodations VIP members. Each building is composed of a different structural system and are presented in a modern sense of traditional construction methods in South Korea. The regular members’ clubhouse building is composed of a hexagonal wooden grid shell roof structure that encompasses the whole building. The VIP accommodations is a short span steel structure in a residential scale. The VIP members’ clubhouse building is reinforced concrete. The atrium space of the main clubhouse is composed of timber columns and roof with an envelope of clear glass providing a transparent and open space. 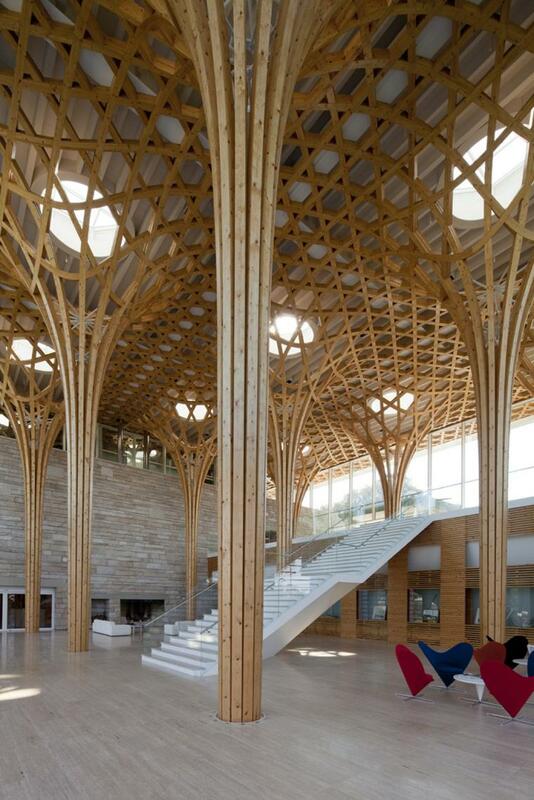 The laminated timber columns arranged in radially climb vertically and curve to become horizontal members at the roof plane forming a hexagonal grid. The lower podium is constructed as a wall of large local stone built like tradtional stone setting of South Korea, gradually slanting inwards towards the top. The transparency and openness of the timber portion serves as the reception area, the members’ lounge and party room. 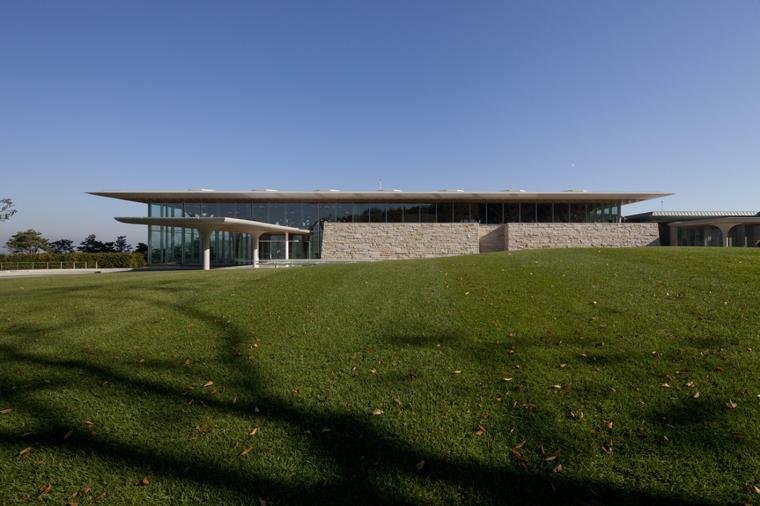 The enclosure of the stone podium includes the more private Locker room area, bathrooms, a spa and building services, and parking is provided in the basement. The open atrium’s transparent curtain wall utilizes stacking glass shutters that enables the atrium to open completely to the outside. The terrace at the upper level uses full-height sliding glass doors to connect the party room interior seamlessly with the outdoors. The three story high timber structure is exposed as the interior finish material, and received fire department approvals by way of oversizing the timber members to act as the fireproofing material. The warmth and texture of the wood is felt in the interior throughout the building.